The fall season is a wondrous time to enjoy your water garden, what with all the luscious fall colors, fewer bugs, and comfortable temperatures. 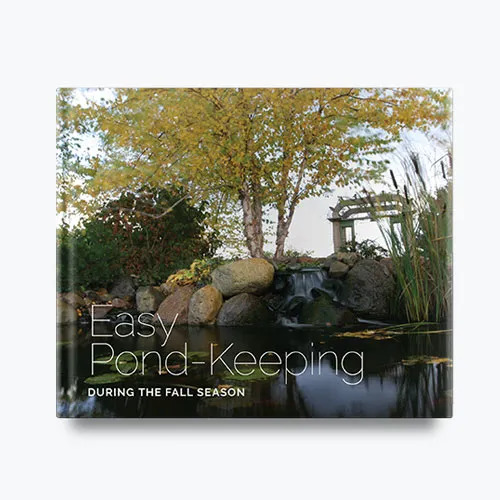 Read Aquascapes E-book, “Easy Pond-Keeping During the Fall Season“, for tips on keeping your pond looking its best during the autumn season. Feeding Fish in Fall requires a bit more care. The colder shorter days lead to the fishes digestive system slowing down. Be sure to check out these tips below to insure proper care is taken so your fish are ready for the colder winter months ahead. You’ve enjoyed watching and feeding your fish all summer, and now it’s time to help them prepare for their winter’s nap. You want to make sure your fish are strong and healthy as Old Man Winter makes his way to your pond. A well-balanced diet is critical to the health of your fish. Aquascape Premium Cold Water Fish Food has been scientifically formulated to provide quality nutrition to all pond fish, including goldfish and koi. The inclusion of spirulina and wheat germ helps make the food easier to digest at colder water temperatures. 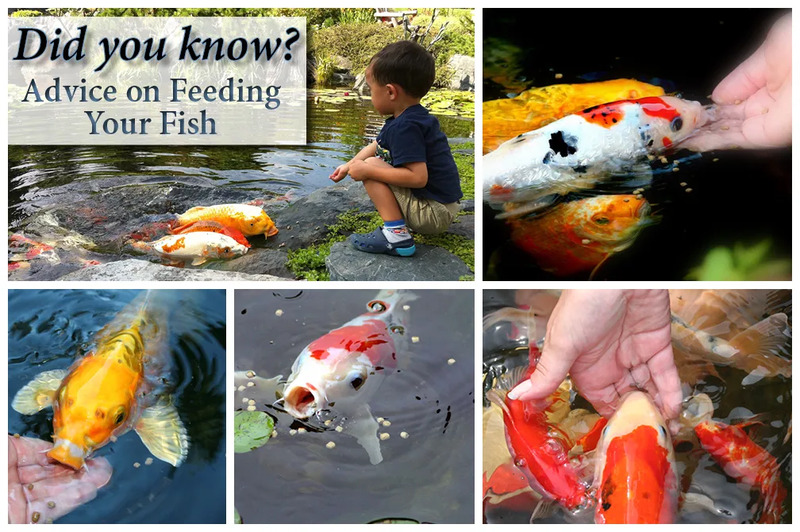 Feeding your fish the proper food will help ensure your fish survive their winter slumber. When spring rolls around and you’re anxiously waiting to see your playful koi once again, you’ll be glad you took consideration in the fall to properly care for them. And remember, you can feed them Aquascape Premium Cold Water Fish Food up until the pond water rises above 60-degrees! Straight from an Uncomfortably humid and soaking wet summer to a nippy cold fall. Wouldn’t be central Pennsylvania without absolutely ridiculous weather. What happen to fall? is it winter already? Soaking wet summer with no dry spells or sunshine? I don’t get it? 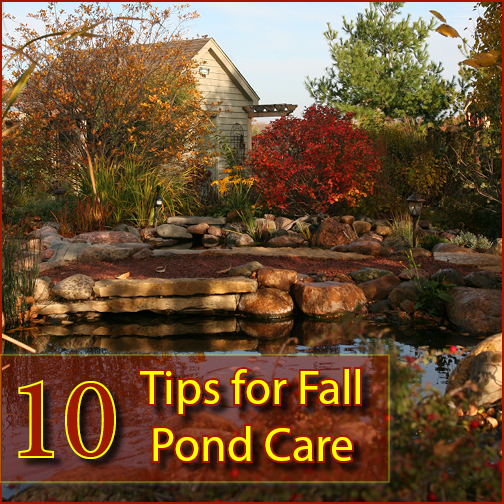 At any rate, it’s technically fall and your pond needs some TLC before the winter hits if it hasn’t already. 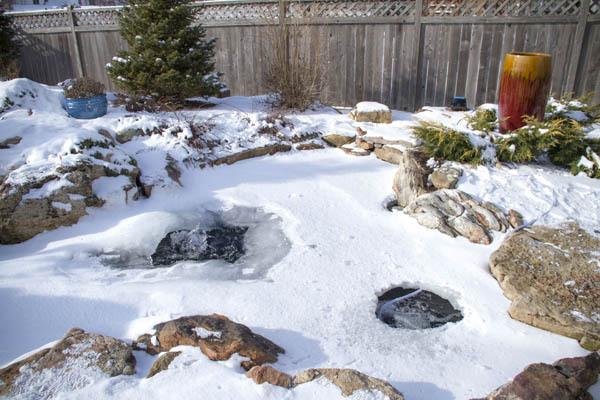 Luckily for you our good friends at Aquascape have compiled 10 tips to keep your pond in proper shape to survive the winter. A nip in the air, shorter days, and the shedding of multi-colored leaves from the trees signifies a changing of the seasonal guard. Gardeners across the country take precautions to protect their landscapes from the harsh reality of winter. Water features in the landscape require special consideration when putting your pond to bed for a long winter’s nap. Pond maintenance chores in the fall and winter vary depending on where you live, but there are some basic guidelines to help your aquatic plants and finned friends weather the chill of Mother Nature. Following is a handy check list to help ensure a healthy pond come spring time. Trim back hardy marginal aquatic plants to 2? above the water to keep the dead foliage from drooping over into the pond. Trim back waterlily leaves and stems to 2-3? above the base of the plant. This keeps dead foliage from decomposing in the pond. Fish dart beneath lily pads while the melodious sound of a waterfall tickles your ears. The fragrance of clean water and nearby flowers intoxicates your senses. Enjoying a naturally-balanced pond in your own outdoor setting is an attainable luxury every homeowner can experience. Your personal vacation spot begins with clean and healthy pond water. 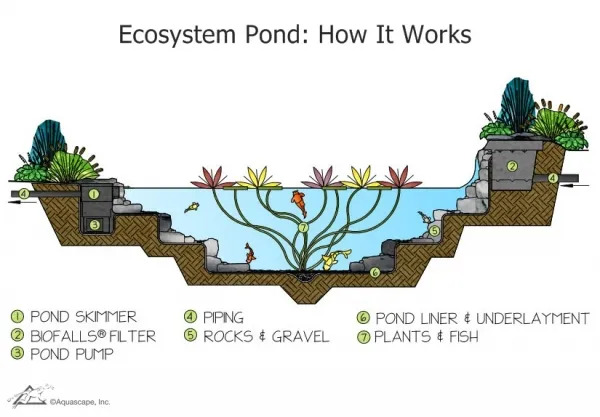 In addition to plants, fish, aeration, and rocks and gravel, a low-maintenance ecosystem pond requires adequate filtration to keep the water clean and clear. Three types of pond filters are available on the market and include biological, mechanical, and sterilizers. Biological filters use bacteria to break down pond wastes, converting them into less harmful compounds that can be used as aquatic plant fertilizers. Mechanical filters trap and remove debris and sediment. Water sterilizers pass water through a tube that houses an ultraviolet bulb, killing living microscopic particles in the water. The main function of mechanical filtration, or pond skimmer, is to remove debris before it sinks to the bottom of the pond and decays. The skimmer also houses and hides the pump and plumbing from view, as opposed to being placed directly in the pond where they become an eyesore. Box-style skimmers come with either vertical or horizontal filter mats. Horizontal mats prove to be the most effective, while providing the least amount of maintenance. In addition to frequent cleaning, vertical mats need to be constantly monitored to make sure there is enough water in the pump chamber for the pump to operate properly. An advantage of horizontal filter mats is that they lay flat so there is no sagging and they don’t lose their shape. They also never clog to the point of preventing water from passing through, so the pump chamber won’t run dry. As water enters the skimmer, the large debris is caught in the skimmer basket and the water is then further filtered through the horizontal mat. The pond water then travels through the plumbing buried underground, up to the biological filter where it’s further treated before re-entering the pond. Mechanical and biological filtration are critical to processing the many types of nutrients found in a pond ecosystem, including fish waste, uneaten fish food, leaves, and runoff from lawns to name a few. High levels of ammonia (a form of nitrogen) are highly toxic to fish and are a major contributor to prolific algae growth, and so they need to be carefully controlled. In water gardening, the primary nutrient that biological filtration utilizes and renders usable is nitrogen. Another important component to pond filtration is the use of plants. 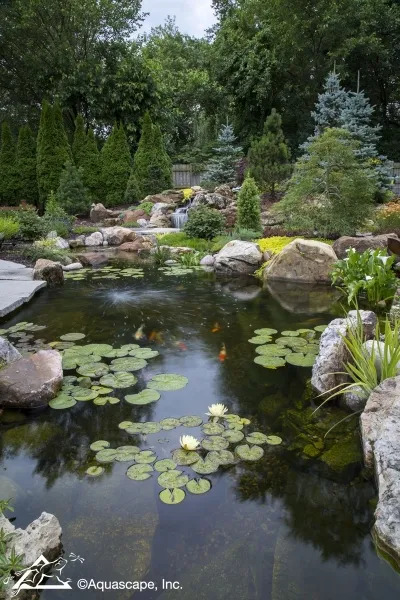 Many gardeners add a pond to their landscape for the variety of aquatic plants available, and while their beauty is certainly an aesthetic asset, a critical benefit is the work these plants do to help filter the water. Plants help purify pond water by reducing nutrients, filtering out sediments and absorbing toxic compounds through the process of phytoremediation. If these excess nutrients are not removed, algae will feed on them, resulting in green water, string algae, or both. Algae control is not the only way plants help create a low-maintenance ecosystem pond. Submerged and marginal plants also provide food, shade, and protection for the fish and other wildlife that live in and around the pond. 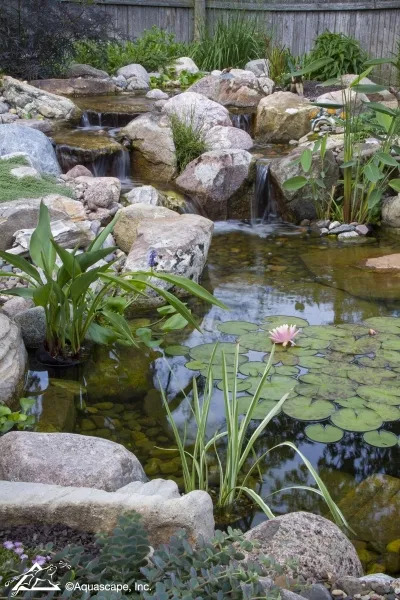 To keep pond water quality high, the simple process of repeatedly turning the water over through the mechanical and biological filters is needed in order to create a naturally balanced, low-maintenance ecosystem pond. 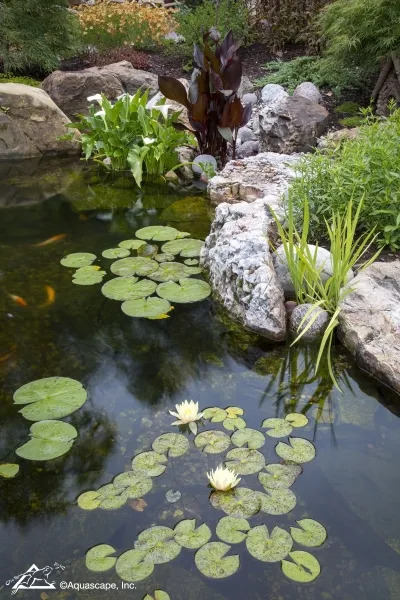 Add the remaining components of plants, fish, aeration, rock, and gravel, and you’ll find greater success in maintaining clean and clear pond water. Your fish are happier and less stressed when their environment is healthy. Not to mention, it’s so much more enjoyable when you can actually see your fish swimming in clean water created by an efficient pond filtration system.